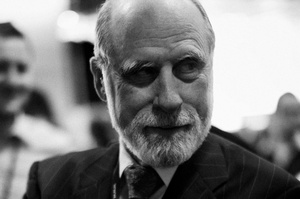 Vint Cerf has worked on much of the technology that now forms the basis for the internet: The ARPAnet network, early TCP/IP protocols and MCI Mail, the world’s first commercial email service. Cerf is the recipient of the Turing Award and the Presidential Medal of Freedom. He was inducted into the “Internet hall of fame” in 2012. Vint Cerf is known as one of the “fathers of the internet.” He sat down with Alexander Görlach to talk about innovation, social networks, and the future of human society.